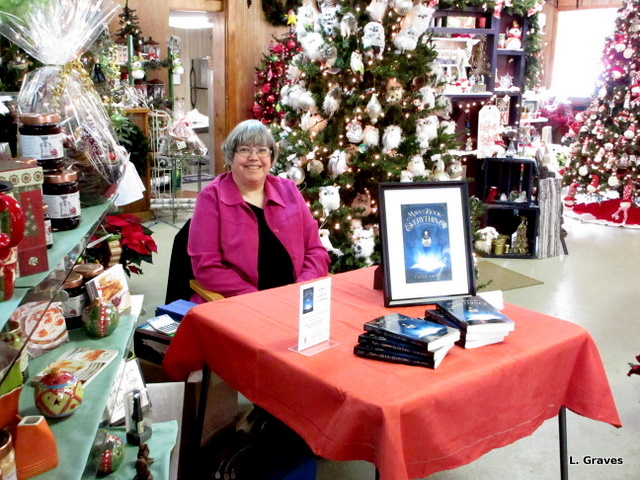 On Saturday, I had a book signing at D.R. Struck Landscape Nursery, and what a delight it was. There is a wonderful gift shop at the nursery, and Robin, one of the owners, has terrific taste. Thus the shop is filled with all sorts of lovely things that are not available anywhere else in the area. Tucked between three decorated Christmas trees, I felt as though I were in the middle of Christmas, a great place to be. The air smelled of mulled cider and eggnog. People came in—some especially to see me—and I sold a good number of books. I am finding I quite enjoy going out and about, talking to people and selling books. Many thanks to Robin for inviting me to sign books at her shop. I am so gratified with the initial sales of the books and the early responses. After Christmas, I will be working to get broader exposure. In the meantime, it’s been a very jolly time at the little house in the big woods. WOW – I love this photo shot – it’s beautiful! I hope you had fun and made lots of money at the book signing – it looks like lots of fun.